This homemade Amaretto Pound Cake has lots of almond flavor from both Amaretto and almond extract. It’s buttery, moist, and sweet and I love to serve it slightly warmed with fresh whipped cream and a few sliced strawberries. If you grew up in the south, you’ve no doubt eaten many pound cakes. My grandmother always had one when we visited her. She didn’t bake, but friends were always bringing them to her. 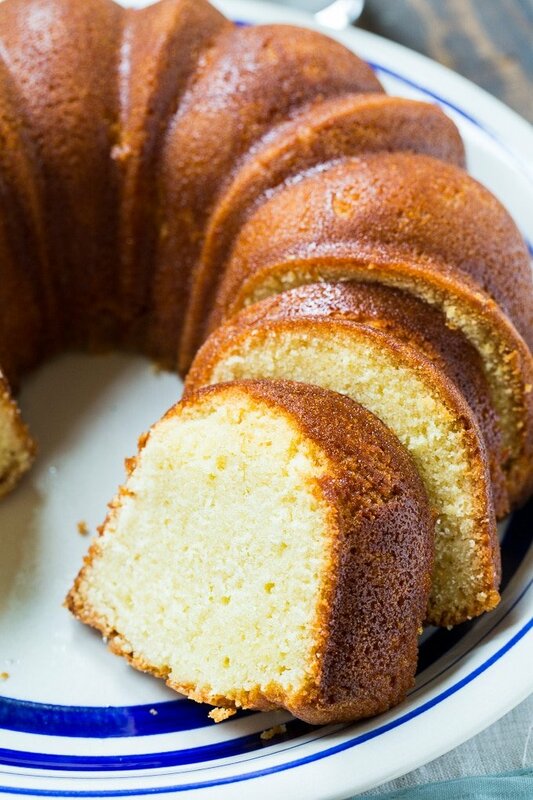 One of the most wonderful things about pound cake is it can feed a lot of people and it freezes really well. I’ll typically freeze half of it. Then I have something to share if I have unexpected guests. 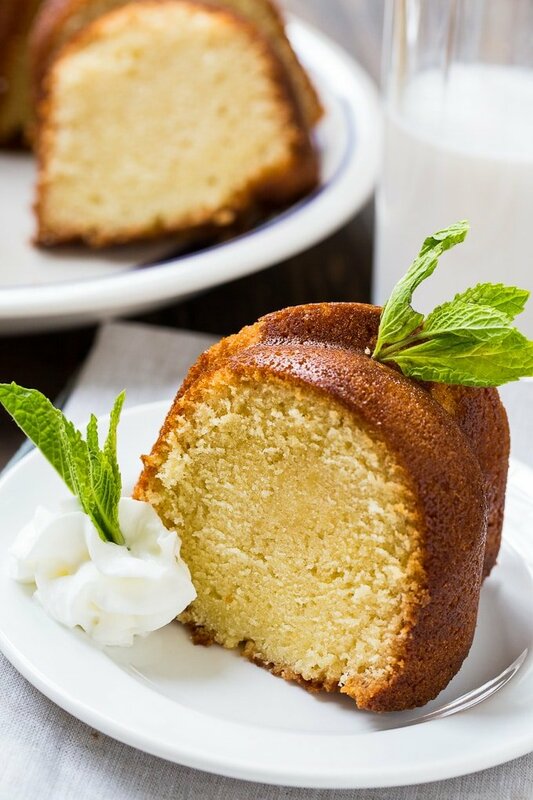 When it comes to pound cakes, you can’t beat this Amaretto Pound Cake. It is fantastically delicious! It has plenty of almond flavor, but it is not overpowering. Tips for making Pound Cake. For maximum volume, start with room temperature ingredients. Cream the sugar and butter until light and fluffy. This can take anywhere from 3 to 7 minutes. Once the eggs are added, beat as little as possible. Just long enough to get the flour mixed in. Make sure your Bundt pan is greased very well. 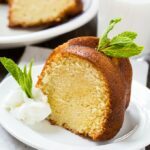 This homemade Amaretto Pound Cake has lots of almond flavor from both Amaretto and almond extract. It's buttery, moist, and sweet and I love to serve it slightly warmed with fresh whipped cream and a few sliced strawberries. Preheat oven to 350 degrees and spray a 10-inch Bundt or tube pan with baking spray. Use an electric stand mixer to cream butter, shortening, and sugar until light and fluffy. Add eggs one at a time. Scarped down the sides of the bowl and beat well after each addition. Mix in amaretto and almond extract. Add flour mixture, alternating with milk. beginning and ending with flour mixture. Pour batter into prepared pan. Bake for 80 to 90 minutes. Cool for 30 minutes before inverting onto a serving platter. This entry was posted in Cakes, Desserts and tagged amaretto, pound cake. Bookmark the permalink. Love all your recipes! Question… could I possibly add semi sweet chocolate chips to this recipe? I’m in love with this cake! Can’t beat the almond flavor! Incredible. One of the best cake recipes I’ve ever made. That is a great post on Amaretto Pound Cake. I really like that and Soon i am going to try this one at home.Thank You! Pics looks good.Cake is looking delicious. learn new recipe.I will share with others.